It doesn’t really feel like summer to me until I’ve had my first ear of sweet corn on the cob. I can eat an outrageous number of buttered, hot, crisp, sweet ears, shearing the kernels off the cob like Mickey and Donald eating it typewriter style. Fortunately, July hasn’t only brought us a super humid heat wave (hello window AC unit! ), it also brought us summer corn season, just in time for the long July 4th weekend. 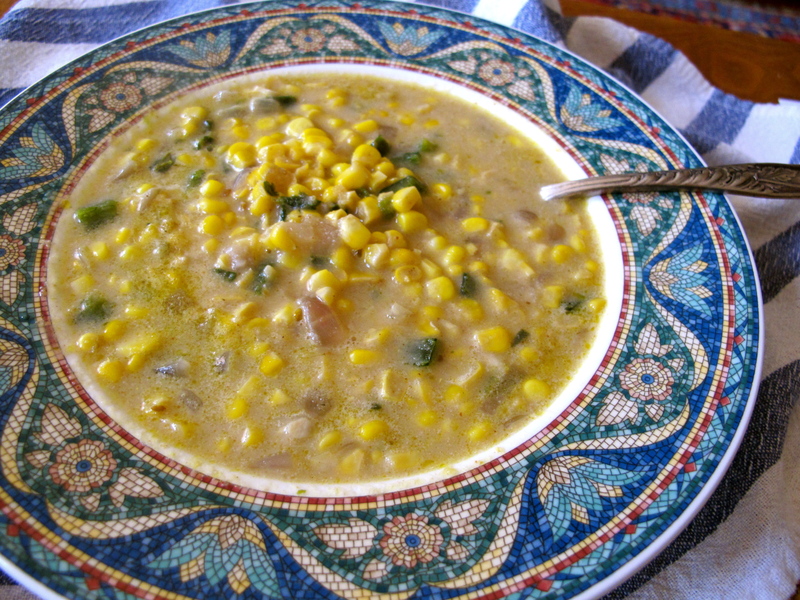 This light summery soup is a lovely way to enjoy the good fresh flavor of sweet corn. It’s lighter than some creamy chowder style soups, finished with just a little bit of milk, but the trick of using a corn cob broth that I picked up from David Walbert’s delicious corn chowder post infuses the soup with the flavor of corn without muddling the bright vegetable flavors. I also use a little bit of corn flour, cooked into the broth like a very thin porridge to thicken the soup without making it too rich and heavy. Soup eaten in summer should be light and fresh, satisfying without weighing down. 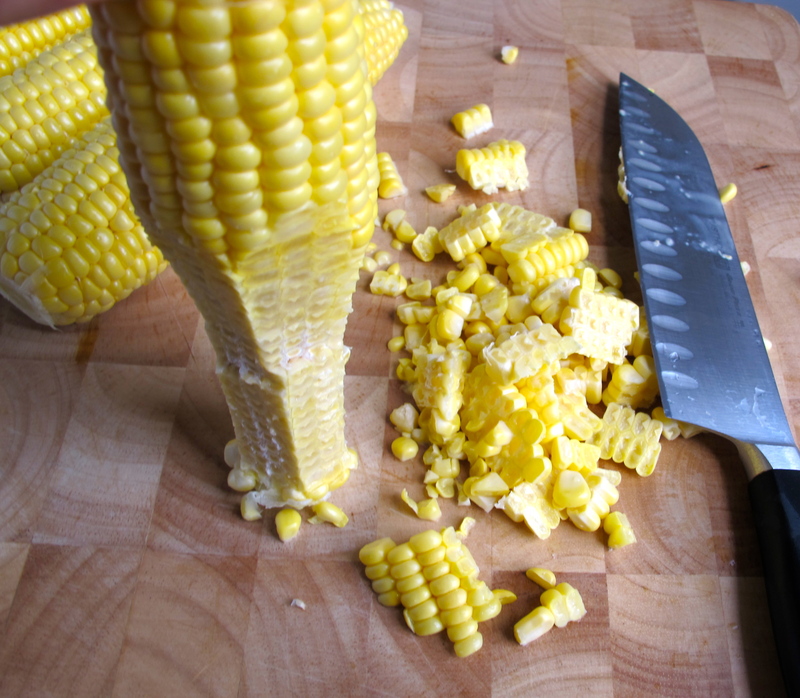 Stand each ear of corn stalk-side down on a cutting board and cut the kernels from the cob. Break the cleaned cobs in pieces and put them in a medium pot. Once all of the corn kernels are cut off the cobs and the cobs are put into the pot, cover the cobs with about 4 cups of water, a generous pinch of salt, and cover the pot with a heavy lid. Simmer the cobs in water for about 30 minutes. Remove and throw the cobs away. Meanwhile, dice the onion and poblano and mince the garlic. Heat a generous glug of olive oil in a large skillet or saute pan over medium/low heat. Add the onion, garlic and poblano to the oil and cook until the onion begins to soften and become translucent. Add the corn and stir, then add a pinch of salt. The sugar in the corn will begin to stick and caramelize on the bottom of the pan, so watch the heat to prevent that sugar from burning. Once the corn begins to soften, scrape the vegetables to the side of the pan and pour in a little more oil, maybe a teaspoon, to cook the spices. Pour the chipotle, coriander, and cumin into the oil and stir. Once the spices become fragrant, stir them into the vegetables. Scrape any sticky browned bits off the bottom of the pan. Once the corn is softened and beginning to caramelize but still a little bit crisp, stir about 1/3 cup of corn flour (finely ground corn meal) into the vegetables. 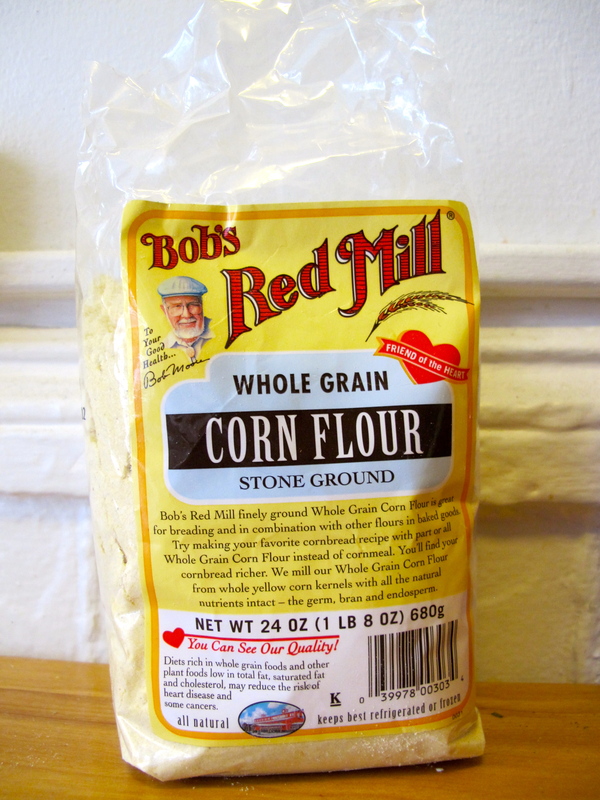 Stir everything over medium heat just for a minute until the corn flour is slightly toasted. 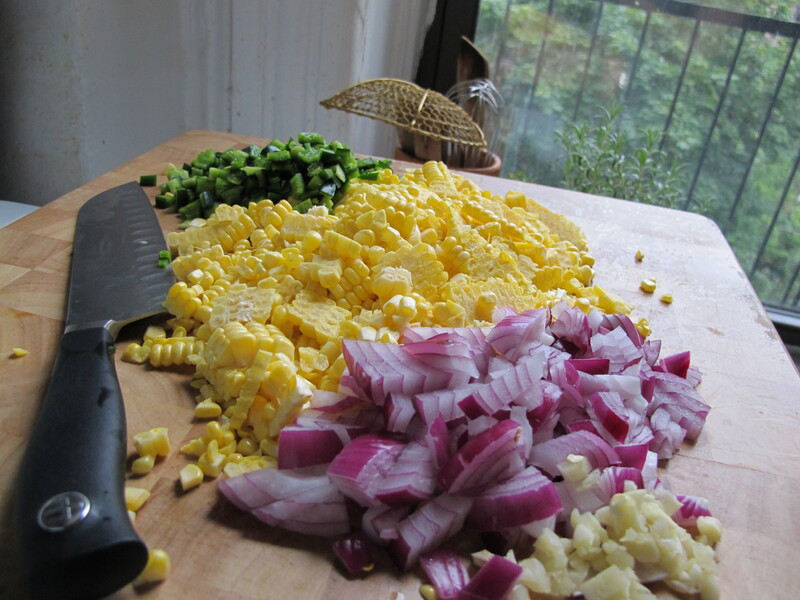 Carefully pour the corn cob stock into the pan with the vegetables and stir to prevent lumps. Bring to a simmer and stir until the corn flour thickens the broth. Add the milk and simmer for 10 minutes or so to combine the flavors. As with most soups, this one improves after a night in the fridge, so feel free to make it ahead. It will be even better that way. There’s a restaurant here with a soup like this that is poured over a morsel of ceviche in the bottom of the bowl when it arrives at the table… Not sure if it’s a hot or cold soup. That sounds really good! Seasoned ceviche or just the fish? I also put some tortilla chips in this one sometimes.